The Standup Act (H.R. 1895)Eliminate The Muda! When even one plane crashes, the story is in the headlines for weeks. But the equivalent of 12 planes full of teens dying every year is barely a blip on the national radar. Support the STANDUP act (H.R. 1895) creates a National Graduated Driver Licensing (GDL) law that would give teens on-the-road experience gradually while helping them avoid risky conditions. In reduces in-car distractions like texting, limits nighttime driving and the number of friends in the car, and increases the required hours of training and supervision. Part of what made this ad from Allstate insurance catch my attention is the fact that I am the parent of a young teen. We are just a few short years from our first driver with another following not far behind. As a parent I want my children to experience life, make mistakes and learn from them. I honestly believe it is better to break an arm trying than to have never tried. But there is a limit to the number and extent of risks I am willing to take or allow my children to take. I fully plan on having a number of rules about when they can drive and who they can drive with. My children will be expected to contribute to the expense of owning and operating our family vehicle. But even with all the rules I put in place, my children will still be on the same roads as kids that don’t have parents who make sound choices. Additionally, even with a community of good parents, some kids will make rash decisions. My parents did everything in their power to provide good guidance. I took drivers education, had my permit the day I was eligible and drove with my parents in the passenger seat for months before getting my license. But no sooner than I had my license in my pocket did I find an excuse to get out from under my parents watchful eyes. 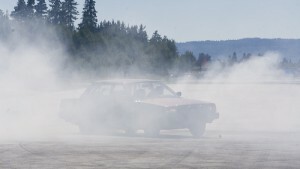 I did doughnuts in the cul-de-sacs, I spun tires from the stop lights and I refused to let any car pass me. I am not naive enough to believe that any GDL program will prevent my kids or any others from making stupid decisions. But I also know that as I gained experience behind the wheel I continued to make better choices. The only thing I would like to see different is a waiver for 16-18 year olds that are working after dark being allowed to drive from work to home. Please encourage your members of congress to support the STANDUP Act (H.R. 1895) by writing to congress. Unfortunately graduated licensing, while decreasing teen deaths, will not reduce auto insurance rates all the while increasing profits for insurance companies. Mandatory seat belt laws pushed by the insurance industry accomplished the same item- reduced costs to society in deaths and injuries but increased profits to the industry which services the market. In theory universal compliance should have reduced costs over the aggregate but the industry never passed this on since hiding behind the “save the children, etc from carnage” banner was an easier sell. Seat belt laws also made seat belt compliance another method which law enforcement can use to initiate vehicle searches and write tickets. econobiker – thanks for stopping by! As a consumer, while I don’t agree with what the insurance companies may have done according to you, it doesn’t surprise me. My primary concern as a parent is forcing kids to gain more experience and maturity before they are released to do what they will. When I was a driver under the restricted driving laws (I’m 19 now, but they were implemented in my state at the time), I got held overtime at my work. I called my mother, who ended up asking a policeman if there was a way to sidestep the law. He said in general, if it’s obvious you’re just going home (clock-out slip and/or uniform available) then they normally won’t punish you.